Eagles have special physiological features that give them the great ability of sight. 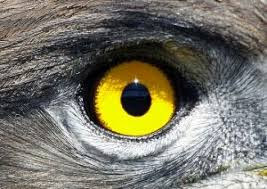 Interestingly, the eye of the eagle occupies 50% of the head, unlike human that the eye, which occupies just 5%. Besides that, the back of the eagle’s eye is flatter and bigger, allowing a larger image to be formed. Also, they have two eyelids. Eagles have a special inner eyelid called the nictitating membrane. This eyelid blinks every 4 to 5 seconds and helps to lubricate the eyes and wipe off dust and particles from the cornea. Another remarkable feature is that eagle’s eyes are angled at 30 degrees away from the midline of their face. This angle allows eagle to see almost all the way to the back of their head. An in depth look at eagle’s eyes shows their retinas are more densely coated with cones than rods, which are very few in number. Their eyes enhance their power to resolve fine details, and are better in day activities than night. In fact, eagles are almost inactive in the night. Information reveals that in eagles, the fovea rich cones have a convex pit. This deep fovea allows their eyes to act like a telephoto lens, giving them extra magnification in the center of their field of view. Amazingly, eagles see five colors, while human see only three. In addition, humans have 200,000 light-sensitive cells per square millimeter of retina, while eagles possess about 1 million light-sensitive cells per square millimeter of retina. One can now understand why eagles have better sight than humans. It therefore concludes that what one can see clearly at 20 feet, an eagle can see it with the same crystal clearness from 100 feet away.